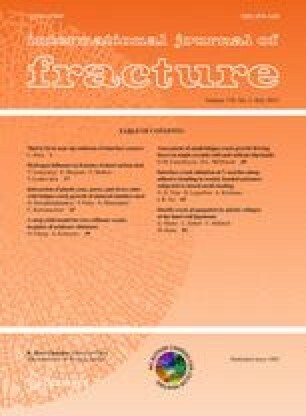 As two cracks grow and approach each other under fatigue loading, a deleterious interaction between them can considerably affect the crack growth rate, making theoretical evaluations and experimental data from a single isolated crack case considerably inaccurate. The aim of the present study is to investigate the interaction between two collinear cracks of equal length, taking into account the plate’s thickness effect, which was demonstrated to have a large effect on fatigue crack growth in the case of a single crack. The obtained solution to the problem is based on the Dugdale strip yield model and the distributed dislocation technique. In addition, a fundamental solution for an edge dislocation in a finite thickness plate is utilised. The present solution shows a very good agreement with previously published results for some limiting cases. The obtained results confirm a significant dependence of the interaction and stress intensity factors on the plate thickness, which can dramatically affect the plastic collapse conditions as well as fatigue crack growth rates.